This 10 day bicycle tour begins and ends in Chengdu, the capital of Sichuan Province and one of the major cultural centers in China. This tour is designed as a relatively easy-going ride. Average daily cycling mileage will be about 30 miles (50 km). On most days we will use vehicle transport to supplement the cycling to get us to the next destination. Luggage will be transported by the support vehicle. This tour will visit both well-known and little-known sights and will appeal to those who have cultural, social and archaeological interests. On the first day, the group will meet and there will be a warm-up tour of the city where we will visit the Panda Breeding Research Center and Wenshu Buddhist Monastery. The following day, we will head north to Xindu to visit the Baoguan Temple and then on to Guanhan to visit the Sanxingdui Archeological Museum with a number of copper masks and other artifacts. Next will head west to Duijiangyan, a location of the historic irrigation system that is still in use today. We will then head south to Anren near Dayi, to visit the Li Landlord Manor. This was used as a re-education center to illustrate the evils of the landlord-serf system and includes an area of clay figures graphically displaying the downtrodden workers being abused by the landlord. Next we travel to Emei Mountain, one of China’s sacred Buddhist mountains for a night’s stay at the summit in order to view the morning sunrise and walk some of the trails. The following day, we will return to the base for a ride to Leshan to visit the Giant Sitting Buddha (232 feet, 71 m). Afterwards we head east to Rongxian for another to visit China's second largest Buddha (193 feet, 58.7 m) and then on to Zigong, the location of dinosaur and salt museums. Continuing east, we will then visit Dazu. Here we will spend two nights to give us time to see a number of Confucian, Taoist and Buddhist sculptures (as well as a Christian church) in the surrounding area. Afterwards, we will return to Chengdu to complete the trip. Chengdu is easily accessible via air from Hong Kong and Beijing, and has good rail access to the rest of the country. Day 1: Chengdu. Meet group members/brief city tour-Chengdu Wenshu Buddhist Temple. Includes: (B), (L), (D). Day 2: Xindu/Guanghan-Baoguan Buddhist Temple, Archaeological Exhibit of Copper Masks from the year 1500. Includes: (B), (L), (D). Day 3: Duijiangyan. Active Duijiangyan Irrigation System set up 2,000 years ago by the State of Qin during the Warring States Period. Includes: (B), (L), (D). Day 4: Dayi-Anren. Landlord Manor Re-education Center. Includes: (B), (L), (D). Day 5: Emei Shan-Scarced Buddhist Mountain. View sunrise from the 10,500 feet/3099 m summit. Includes: (B), (L), (D). Day 6: Leshan-Giant (193 feet/58.7 m). Sitting Buddha. Includes: (B), (L), (D). Day 7: Rongxian and Zigong-Rongxian-Big Buddha. Zigong-Dinosaur and Salt Museums. Includes: (B), (L), (D). Day 8: Dazu-Confucian, Taoist and Buddhist Sculptures carved in surrounding hillsides. Includes: (B), (L), (D). 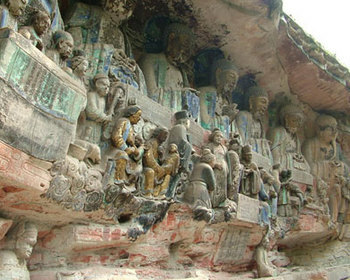 Day 9: Dazu-Confucian, Taoist and Buddhist Sculptures carved in surrounding hillsides. Includes: (B), (L), (D). Day 10: Chengdu. Return to Chengdu by vehicle. End of trip. Includes: (B), (L). - Transport of gear (and cyclists when necessary).